Last year, reclusive guitar virtuoso Buckethead (Brian Carroll) gave an extremely rare interview on a podcast called Coming Alive. He revealed that he’d been dealing with a rare heart condition that had become significantly more debilitating recently, to the point that at times, “even walking across a room is difficult…It got really intense, so I went to the doctor and they said, ‘You’re on the verge of having a stroke. '” He didn’t mention whether this condition contributed to his hiatus from touring; the prolific artist took a break from the road from 2013-2016, and he has also bowed out of all of his collaborative projects since 2012. Buckethead hasn’t been idle throughout these years, though. He’s released over 20 albums per year for the past five years, including 118 in 2015 alone. He finally hit the road again in 2016, including a stop at Shank Hall, where he returned for a sold-out performance on Saturday night. Fanatics were already lined up outside the door at least three hours prior to showtime, and Buckethead delivered a typically blazing, nearly two-hour performance, drawing heavily from his classic ’90s catalog as well as a smattering of covers and material from prior bands (though sadly, no Guns N’ Roses tunes). Although he did a brief tour with a two-piece backing band last year, 2018 has seen a return to true solo performances, featuring backing tracks that he triggers while playing to simulate a full-band sound. He’s been doing this for at least 15 years, and it’s funny to think that he drew criticism for it back in the day when it’s a fairly common practice across all genres of music now. The show featured all of Buckethead’s nonmusical trademarks as well, although he only treated fans to one very brief nunchaku/robot dance interlude. As always, he took several minutes to pass out various toys and random novelty items to fans in the front row (although “Buckethead’s Toy Store” did not play in the background), and there were the usual bits of horror-flick dialogue and ambience sprinkled in between songs. Of course, his primary claim to fame may be his lightning-fast computerish noodling, which guitarists from metal to prog to jambands have attempted to emulate over the past couple of decades, but few shredders possess the finger speed and dexterity of Buckethead. Whatever health issues he has struggled with, they don’t seem to have diminished his technical proficiency. Although his setlists have been populated mostly by the same basic rotation of songs for the past decade-plus, he has added some new effects to his rig recently, most notably a slimy fuzz effect for slapping (notably during “Welcome To Bucketheadland”) and a demonic, hollow-sounding growl that gave “Night Of The Slunk” and “Jordan” a whole new feel. He deployed his various fine-tuned effects combinations unpredictably throughout Saturday’s show, and although there were a few technological hiccups, most transitions were remarkably smooth, and the energy rarely flagged at all. 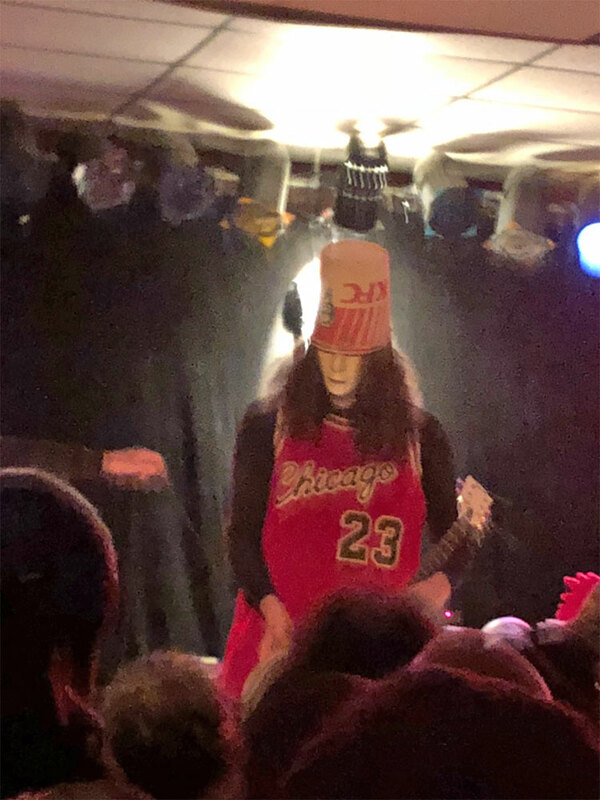 In fact, any lull in the spastic sonic overload threatened to break the spell of the performance, as Buckethead almost had to wail at maximum volume to drown out his fans. During the occasional quiet moment—for instance, the mellow intro to the Praxis staple “The Interworld And The New Innocence”—the crowd chatter was egregious. While Buckethead could easily entrance an appreciative audience with two hours of nothing but acoustic guitar, Saturday’s noisy bunch illustrated why he doesn’t often play many of his gorgeous low-key nuggets. Fortunately, he’s a fascinating performer pretty much regardless of what he’s doing onstage. Even his expressionless white mask has come to evoke a distinctive pathos, and there’s no denying the passion in his playing when he’s in the throes of a particularly triumphant “Nottingham Lace” or “Soothsayer” solo. Likely a tribute to the recently deceased Malcolm Young, Buckethead’s instrumental rendition of AC/DC’s “Bad Boy Boogie” actually got the crowd to shut the hell up; it was an oddly emotional moment in a show that was admittedly more about firepower than subtlety. 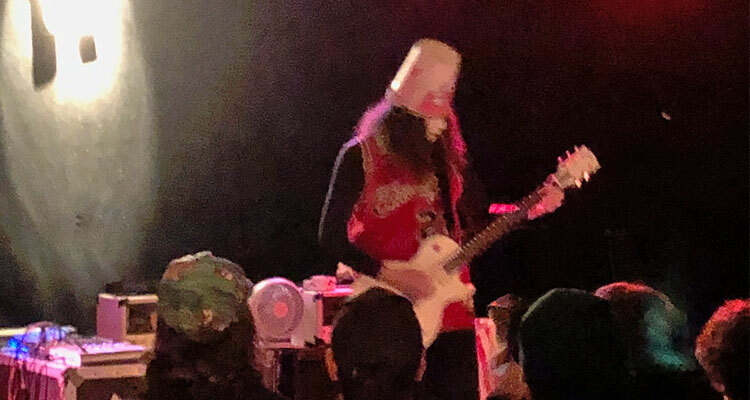 Fans know what to expect by now at a Buckethead show, and any chance to catch the wizard while his health still permits him to perform at this level can’t be taken for granted.